Red Apple Furniture is a furniture manufacturing city of Shenzhen Tian, Shenzhen Tiancheng Furniture Co., Ltd. specializes in high-grade furniture, mattresses and sofa's R & D, production and operation, is the largest furniture manufacturing companies. Red Apple furniture company invested heavily in the introduction of technology and equipment innovation, now has from Germany, Italy, the United States, Switzerland, introduced a full set of production equipment, furniture and mattresses, to achieve a high quality, efficient, modern, environmentally friendly production concept. 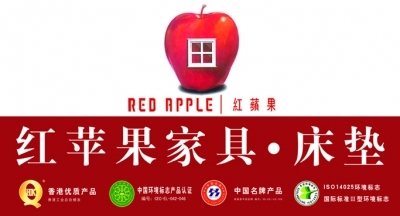 All along, the Red Apple furniture to ensure environmental protection of furniture, to the raw materials of the company must go through the testing center (mainly for the furniture of harmful substances - formaldehyde) were detected after passing to stock and will from time to time the materials to be tested, Nanjing Forestry University. And every year, National Furniture Quality Supervision and Inspection Center (Guangdong) will periodically sampling the company's products, its purpose is to ensure high product quality. 2007 Red Apple furniture obtained by the State Environmental Protection Administration Certification Center issued "China environmental Labeling Product Certification "certificate (ie: 10 Central Authentication). Build quality furnishings, attentive service - This is Red Apple furniture solemn commitment to the global consumer. Today, Red Apple Furniture is already done, we believe, will do better next Red Apple Furniture!